According to our estimate, there are about 3.45 million Muslims of all ages in the U.S., or about 1.1% of the U.S. population. This is based on an analysis of census statistics and data from a 2017 survey of U.S. Muslims, which was conducted in English as well as Arabic, Farsi and Urdu. 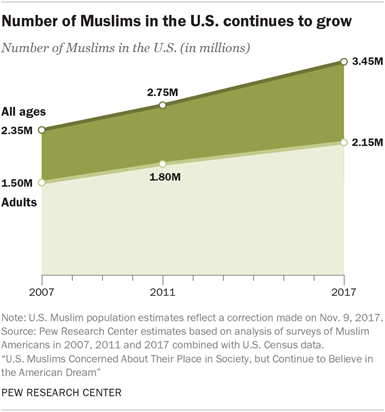 Based on the same analysis, Pew Research Center also estimates that there are 2.15 million Muslim adults in the country, and that a majority of them (58%) are immigrants. This partisan gap extends to several other questions about Muslims and Islam. Indeed, Republicans and Republican leaners also are more likely than Democrats and those who lean Democratic to say they are very concerned about extremism in the name of Islam, both around the world (67% vs. 40%) and in the U.S. (64% vs. 30%). In addition, a December 2016 survey found that more Republicans than Democrats say Islam is likelier than other religions to encourage violence among its believers (63% vs. 26% of Democrats). And while most Americans (69%) believe there is a lot of discrimination against Muslims in the U.S. today, views are again split by party: 85% of Democrats and those who lean Democratic and 49% of Republicans and GOP leaners hold this view. Republicans also are more likely than Democrats to say that Islam is not part of mainstream American society (68% vs. 37%) and that there is a natural conflict between Islam and democracy (65% vs. 30%). About half of Americans (49%) think at least “some” U.S. Muslims are anti-American, greater than the share who say “just a few” or “none” are anti-American, according to a January 2016 survey. Views on this question have become much more partisan in the last 14 years (see graphic). 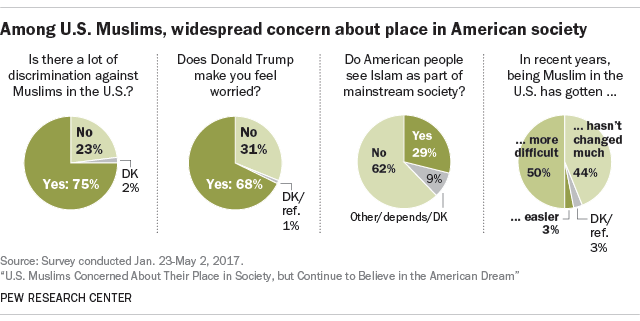 But most Americans do not see widespread support for extremism among Muslims living in the U.S., according to a February 2017 survey. Overall, 40% say there is not much support for extremism among U.S. Muslims, while an additional 15% say there is none at all. About a quarter say there is a fair amount of support (24%) for extremism among U.S. Muslims; 11% say there is a great deal of support. A 2011 survey asked about characteristics Westerners and Muslims may associate with one another. Across the seven Muslim-majority countries and territories surveyed, a median of 68% of Muslims said they view Westerners as selfish. Considerable shares also called Westerners other negative adjectives, including violent (median of 66%), greedy (64%) and immoral (61%), while fewer attributed positive characteristics like “respectful of women” (44%), honest (33%) and tolerant (31%) to Westerners. Half of Muslim Americans say it has become harder to be Muslim in the U.S. in recent years. And 48% say they have experienced at least one incident of discrimination in the past 12 months. But alongside these reports of discrimination, a similar – and growing – share (49%) of Muslim Americans say someone has expressed support for them because of their religion in the past year. And 55% think Americans in general are friendly toward U.S. Muslims, compared with just 14% who say they are unfriendly. 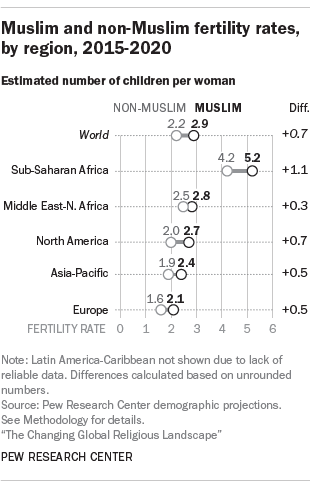 Living in a religiously pluralistic society, Muslim Americans are more likely than Muslims in many other largely Muslim-majority nations to have a lot of non-Muslim friends. Only about a third (36%) of U.S. Muslims say all or most of their close friends are also Muslims, compared with a global median of 95% in the 39 countries we surveyed. 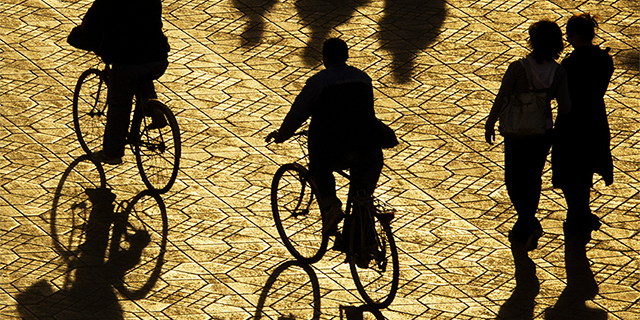 Roughly two-thirds of U.S. Muslims (65%) say religion is very important in their lives. About six-in-ten (59%) report praying at least daily and 43% say they attend religious services at least weekly. 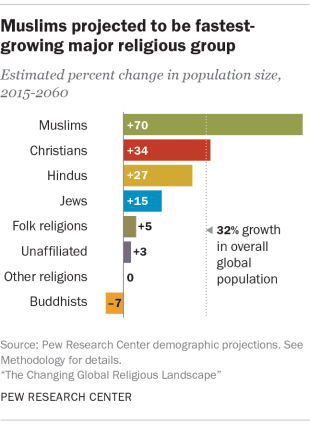 By some of these traditional measures, Muslims in the U.S. are roughly as religious as U.S. Christians, although they are less religious than Muslims in many other nations. Sunnis and Shiites are two subgroups of Muslims, just as Catholics and Protestants are two subgroups within Christianity. The Sunni-Shiite divide is nearly 1,400 years old, dating back to a dispute over the succession of leadership in the Muslim community following the death of the Prophet Muhammad in 632. While the two groups agree on some core tenets of Islam, there are differences in beliefs and practices, and in some cases Sunnis do not consider Shiites to be Muslims. With the exception of a few countries, including Iran (which is majority Shiite) as well as Iraq and Lebanon (which are split), most nations with a large number of Muslims have more Sunnis than Shiites. In the U.S., 55% identify as Sunnis and 16% as Shiites (with the rest identifying with neither group, including some who say they are just a Muslim). Note: This post was updated on Aug. 9, 2017. It was originally published Dec. 7, 2015.